Regular, weekly services take place at Hatherton URC on Sundays at 11am (children leave for Junior Church part way through the service) with Holy Communion celebrated every other month by an ordained minister. Our building dates from 1881 and is largely unaltered. It has recently been granted Grade II Listed Building Status by English Heritage. There is a rear balcony and leaded light windows. 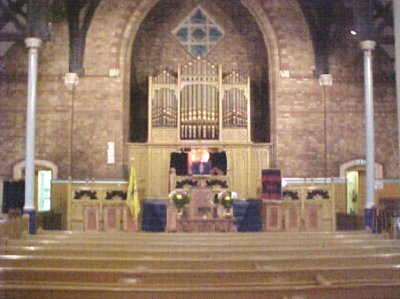 It has a raised pulpit and choir stalls and a pipe organ by the local firm of Nicholson & Lord. Rooms added in 1904 comprise a large upper hall with stage and a smaller hall on the ground floor with a Minister's vestry and office. A modern kitchen and toilets with disabled facilities are provided. A separate entrance to the halls provides ramped disabled access. 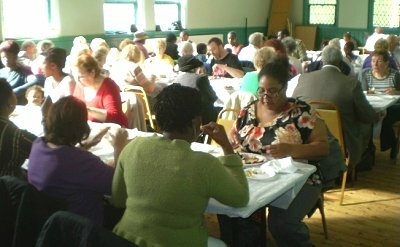 Our halls are hired by various local organisations, eg Friendship Circle for the bereaved, Militaria Society and the Mitchelburne Society.